Commercial landlord focuses reinvigorating downtowns to support local retail business tenants. Fresh paint and new awnings have given Lincoln Avenue in Winnetka a revitalized look and feel. The positive buzz and energy going on with Hoffmann buying buildings and renovating is exactly what the community needs. -- Patrick O'Neil, Winnetka restauranteur. While analysts wring their hands over the impending death of brick-and-mortar retail stores, maverick investors are seizing the opportunity to re-invigorate the downtown shopping experience. Hoffmann Commercial Real Estate is leading that charge, aggressively expanding its portfolio in carefully targeted markets to create attractive destination neighborhoods filled with successful local businesses. Hoffmann’s strategy identifies high-potential properties in curated, concentrated areas as existing owners back away from retail sectors. The company then invests in both improvements to individual properties and enhancements to the general neighborhood, ranging from fresh paint, awnings, and signage to sculpture walks, live music performances, and other promotions. Result: sleepy downtowns become engaging destinations for shopping and dining. Based on the North Shore, the company has transformed downtown shopping areas in Avon, Colorado including the Beaver Creek Ski Resort and Naples, Florida’s Old Towne 5th Avenue South, achieving tenancy rates of 97 percent across more than 60 properties nationwide. 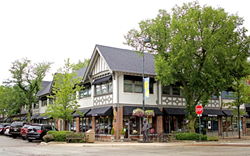 Hoffmann is now expanding its footprint in the North Shore suburbs of Chicago, particularly in downtown Winnetka where it has acquired 14 properties. Most of the tenants are small businesses, many with deep roots in the community. Storefronts along Lincoln Avenue, Elm Street, and Chestnut Court are being spruced up, and foot traffic to local cafes and businesses is boosted by new statuary and weekend music. Hoffmann’s business tenants appreciate the company’s commitment to enhancing the overall appeal of their properties. For more information on Hoffmann Commercial Real Estate, visit HoffmannCRE.com. Hoffmann Commercial Real Estate is an established real estate holding company headquartered on the North Shore of Chicago. Hoffmann Commercial Real Estate transforms and maintains properties to a Class “A+” standard, or more commonly known as the “Hoffmann Standard.” This commitment to excellence contributes to the company’s overall tenancy rate of 97 percent. The company's portfolio is rapidly growing, consisting of both stabilized and value-add properties in strategic locations throughout the country, with future investments in the United States and abroad. Our reputation represents an unrivaled commitment to excellence and is becoming more widespread with every transaction. Learn more at HoffmanCRE.com.